Hidalgo County Drainage Districtt number one workers remove mud from a ditch being built on Rooth Road to connect to another ditch on Saturday, Sept.15, 2018, in Edinburg. Hidalgo County voters are encouraged to vote for county Drainage District No. 1’s Proposition A on the Nov. 6 general election ballot. Early voting continues through Friday. Life near the coast has obvious benefits. One of the country’s highest-rated beaches, open-water fishing, unique nature and wildlife areas and the dining and entertainment venues that cater to tourists who come to see all those features are just a short drive away. But our location also carries risks; living at sea level, and in the traditional path of Atlantic storms, means local residents always must be prepared for possible flooding. We need only look back a few months to remind us of that risk. Heavy June rains overloaded local drainage systems and caused widespread flooding throughout the Rio Grande Valley. Many homeowners are still dealing with the aftermath, paying for home repairs that have been made and looking for ways to pay for those that haven’t. Prop. 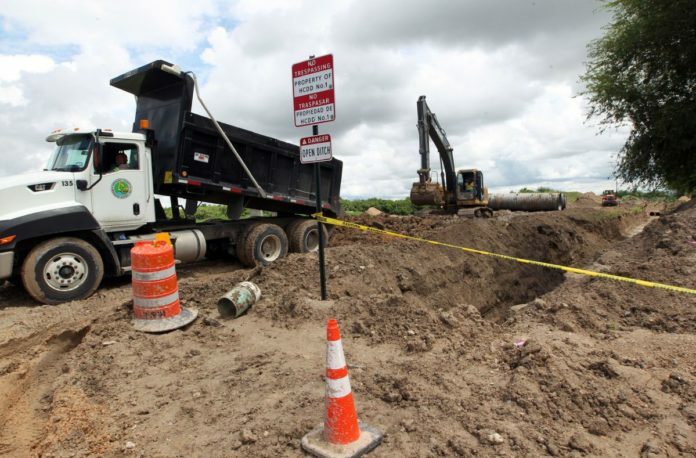 A would authorize the drainage district, managed by the county’s Commissioners Court, to sell up to $190 million in bonds to finance drainage repairs and improvements. To pay for those bonds, the district would add 3 cents per $100 in property tax assessments. This means that people with $100,000 in taxable property would pay $30 more per year, for a total of $125 charge from the district. McAllen voters earlier this year approved a similar $22 million drainage bond issue, so some taxpayers’ increase would be about $50. In return, the improvements should reduce those homeowners’ risk of paying thousands of dollars to repair flood damage every time a major storm hits the region. And such events aren’t uncommon. In addition to the damages suffered in June, the county endured major flooding in 2015, as well as 2008 when Hurricane Dolly swept through the area. Prop. A essentially is an insurance policy, an investment in reduced flooding and better protection to residents’ valuable property. More important is the reduced threat of drowning or injury that arises when water reaches dangerous levels. The value of human life is immeasurable, and the improved safety of reducing flood risks is well worth the investment. The Federal Emergency Management Agency’s recent rejection of requests for aid to address June flood damage shows that we can’t rely on state or federal government help to be there when we need it. Improved drainage lessens the chance that such help will ever be needed. Voting for Proposition A, committing to a tax increase of $2.50 a month, could save Hidalgo County residents untold millions in cumulative savings by reducing the threat of flooding and the damage and injury it can bring.